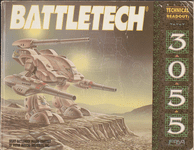 The first edition contained updated versions of a number of BattleMechs for which the image rights were owned by Victor Musical Industries, Inc. These 'Mech entries were removed in the revised edition issued in 1996 as the result of a legal dispute. As the revised edition didn't add any content in to replace these missing 'Mechs, you get more Mech's for your money if you buy the first edition of this expansion. The corrected 2nd printing fixed a number of errors, but far from all - particularly for the Grand Titan BattleMech. which took several errata to make game-legal.